Flour: I don't care if you use one teaspoon of flour. It gets everywhere and on your hands and its just basically annoying. It feels weird on your skin too right? Peeling potatoes: Why do I have to explain this? How can we put men on the moon but I still have to peel the skin off a dirty potato? It takes FOREVER. Brining: I'm sure this has merit and I will explore that at some point, but it feels like I spend a lot of time and salt and then rinse it down the drain only to have the same meat I had before. Frying bacon: We cook bacon in the microwave at my house and it's so clean and not burning. Why do I need hot grease burning my hands off? I don't need that. But oh my word have you ever cooked onions in bacon fat?? The smell is heavenly and makes the ER visit so worth it. Boiling chicken: BARF. THE SMELL IS SO GROSS I HAVE TO QUIT TYPING ABOUT IT. I have a very sensitive gag reflex. What ingredients or steps make you almost always rule out a recipe? I tried a new restaurant after Christmas called Pizza120. It is so fun! Foodie heaven! Rows and rows of ingredients to build your own pizza and they are all $7.99. Think Subway but not gross. I built a deliciously wonderful pizza and that price I felt no pressure to share a pizza and try to get what someone else wanted on it instead of what I REALLY wanted on it. I hate compromising about food or sharing small amounts of food #fatkidprobs Speaking of being a fat kid, just FYI I at my entire pizza. My friend only ate half of hers, so it's probably big enough for two normal people. But not for me. I'll need my own every time. So you build your pizza, and then they bake it in 120 seconds! Flipping crazy! Also they have this machine that makes the dough perfect every time. It's worth a visit! Artichokes, onions, bell peppers, pesto, and every single cheese they had. 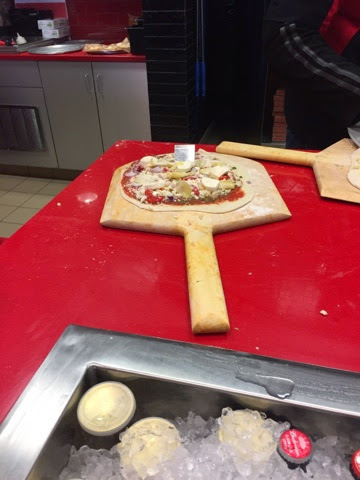 What do you like on a pizza? I cannot TELL you how much I dreaded stopping at fourteen thousand places for Thanksgiving as a child. Mostly for one reason. Turkey. Blah. Baked turkey. Double blah. Dry, bland, opposite of delicious. I would've preferred deli meat turkey to be honest. And then..a Thanksgiving miracle happened. I don't know who told my grandparents about deep frying turkey but GOD BLESS THAT PERSON. Everyone who tries our turkey now loves it, and I request it multiple times throughout the year. I decided to attempt this feat with no male supervision for a work party (I'm a very capable independent woman but in my family men do turkey. It's just how I was raised don't freak out)..I was nervous, but it turns out, it's really easy. We have a Char-broil Big Easy Infrared Fryer. It uses no oil, it just cooks it with lasers or something. I don't know science people but it's magic. No burns or house fires, that's all you need to know. I chose to make a turkey breast which in hindsight wasn't good, because people couldn't stop eating it and I should've made the biggest turkey the fryer would hold instead. 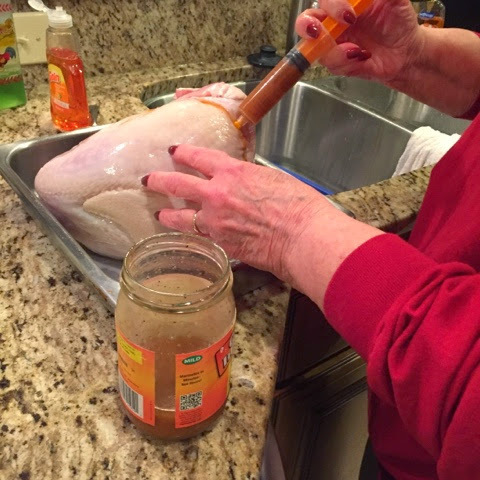 My grandmother always preps the turkey so I observed her ways while she taught me what to do. All she does is rub it down with Tony Chachere's seasoing, and then we use a premixed jar of cajun injection stuff from Publix. She sprinkled a little Tony's in the jar first. Don't be fooled by the word cajun, it's not spicy. And we all know I can't eat anything with more kick than ketchup, so you can trust me here. You have to pull the needle out as you are injecting the liquid to get the mixture spread out. If you can work a propane tank, the frying part is pretty easy too. Ten minutes a pound, or whatever your fryer's instructions say. Sorry I've just ruined all other turkey eating experiences for you, but not that sorry because it's going to blow your mind. Don't even get me started on how good the sweet cranberry sauce tastes with the spices on the turkey because I might decide to go fry one at 9:51pm on a Friday. Goodnight..if you need me I'll be dreaming of turkey. Any food that you've totally revamped and now love? I rarely wear aprons. I feel like they slow me down. I mean it's not like I'm cooking in a custom Dior gown or anything. It ain't that deep if a little sour cream gets on my sweat pants, you know? However, two different aprons reminded me during the holidays of the women who helped create my love of all things food..both of my grandmothers. Even then, I had so much talent. My Nannie and I created my first recipe around age 5 (scrambled egg with a piece of American cheese on top). 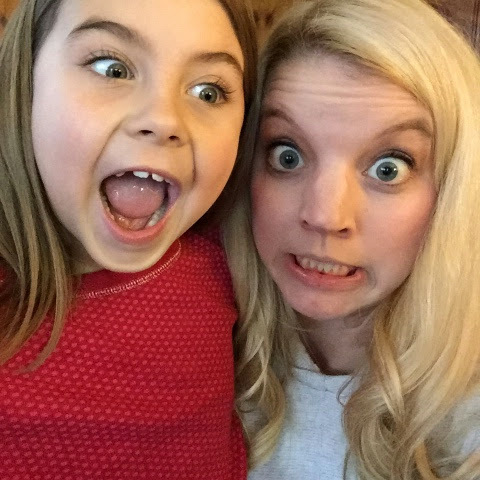 She was so laid back about letting me crack eggs, or do anything that might drive most people, myself included, crazy with such a small child. She let me try crazy things and we always laughed in the kitchen. She also let me do fun crafts all the time, and this apron is one of them. It's at least 20 years old, maybe older. And when I went to her house on Christmas Eve, I realized it's still hanging in her kitchen. The longer I thought about it I realized..it's always been there. I was the first to come through her kitchen, but 5 other little girls have probably worn that apron at one time or another since then. 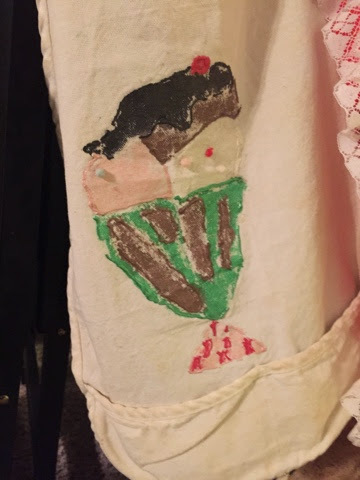 Even now when Nannie can't do quite as much as she used to, I know Preslee (the youngest of the granddaughters) is still rocking that ice cream cone apron often. When I say rock, I mean it. She is 110% fierce, this one. I lived with my other grandmother from age 4 to 13, and I do again now. She's taught me how to make so many things I can't even begin to keep track. She gives me free reign over her kitchen all the time, which is basically like being in a Chopped kitchen. So many fun ingredients. We love to collect all kinds of different international ingredients, I'm sure we have ten kinds of vinegar in the pantry right now, and there are spices in at least four different cabinet/drawers. It's a foodie heaven. 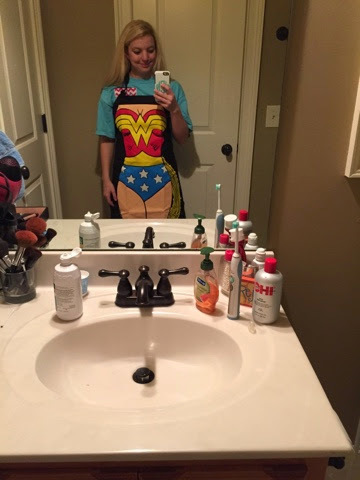 For my birthday she gave me a Wonder Woman apron and we had such a good laugh about it..for obvious reasons. I didn't know an apron could feel a little skanky. I hope that this blog in some (tiny) way continues the incredible tradition they've passed down to me of sharing love through food. I know I sound 99 years old, but the best memories really are made in the kitchen. Who taught you how to cook? Did you hover around the kitchen as a child, too, or just me? 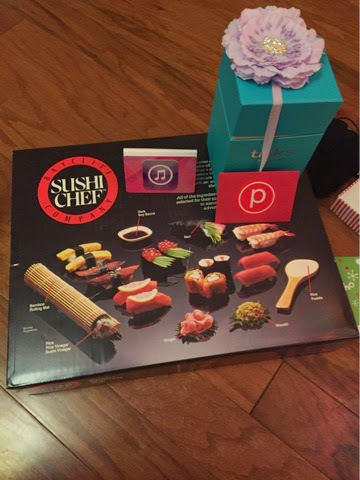 For Christmas, my mother got me a SUSHI MAKING KIT. I'm so excited to use it and learn and watch youtube tutorials and laugh and fail and then eventually make good sushi. In fact, it's one of my goals for 2015. Learn to make sushi. Freezer meals. Can. not. tell. you. enough. I love these freezer meals. I'm definitely doing round 2 soon to get me through all the holiday events I'll have going on. If you are remotely busy, or ever dread cooking after a long day, I HIGHLY recommend doing this. See my initial explanation here. This recipe turned out more liquid-y than I thought it would be, but it was very good. You can always add a little cornstarch mixed with cold water anytime things need thickening. Thin or thick it doesn't matter, this was yummy! Heat olive oil in a skillet over medium high heat. Season chicken with salt and pepper and cook in skillet for 2-3 minutes on each side. Divide chicken into gallon freezer bags. Divide remaining ingredients except noodles into bags. Label and freeze. To serve: Thaw. Cook in crockpot on low for 4-6 hours. Prepare pasta according to package directions. Serve over chicken over pasta. I divided this one into 2 gallon bags because it makes 6 servings. My general rule is, any recipe that makes more than 4 servings I divide into two bags. Totally depends on your family size. If you've been following along, you I had this crazy idea to try approximately one thousand freezer meal recipes in July. We're still eating them and it has been an awesome time saver for us so far, especially on nights where I have a trunk show or some other commitment. You can see my overall approach on the the linked post, and where the orignal recipes came from. This one was supposed to be gluten free and dairy free, which I didn't follow exactly, I just wanted something I could make with ground pork. The original recipe called for ground chicken, but I subbed. We've heated these up for snacks, during football games, for a lazy dinner with some rice, just whatever. This is one of the only things in the whole cooking day that I actually cooked. They were a little time consuming since you have to roll the meatballs, but I will definitely make them again. If any of the chopping is intimidating, just use dried ginger and garlic to save a step or two. But oh.my.goodness. the way fresh ginger smells is worth it. It's like the cleanest most fresh smelling ingredient ever. If you've never used it, just cut away the peeling with a small knife and use a grater on the flesh of the ginger. Combine all ingredients in a large bowl. Scoop into rounded tablespoon sized balls and place on a cookie sheet lined with parchment paper. I ended up rolling these like when you play with play doh, but they aren't going to be as firm or ball like as a regular meatball because of all the liquid. Don't stress if they aren't perfectly round-they still taste phenomenal. Bake at 400 degrees for 15-20 minutes. Once they come out of the oven, let them sit out for about 5 minutes to cool down just a little, then place the cookie sheet in the freezer to flash freeze the meatballs. Just freeze them until they are solid and won't stick together, maybe 20 minutes. You'll just have to check them. Then place them in a freezer bag. To serve, thaw in the microwave for 1-2 minutes. These are super great to have in a pinch because you can reheat them so fast. What's your go to make ahead snack/meal? For the past 27 years, I've been in a very passionate relationship with food. I really started cooking in college when I realized I probably couldn't survive on just carrots and ranch. 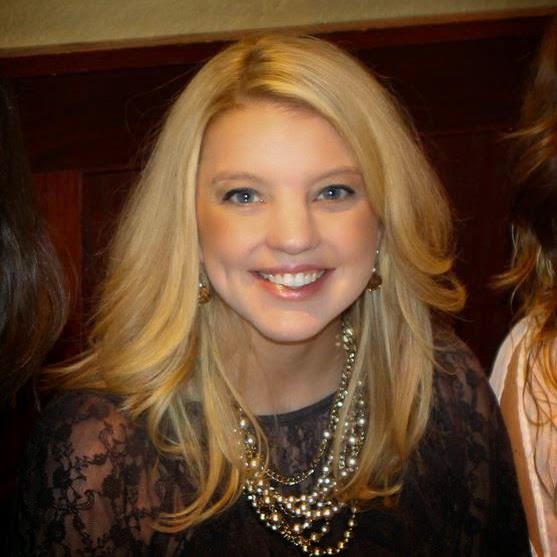 I work as a ministry assistant at my church during the day, and I'm a Senior Stylist with Stella and Dot, a fabulous accessories line. Other than cooking & eating, I love to travel, rewatch entire seasons of my favorite television shows, and do anything that makes me ugly laugh.